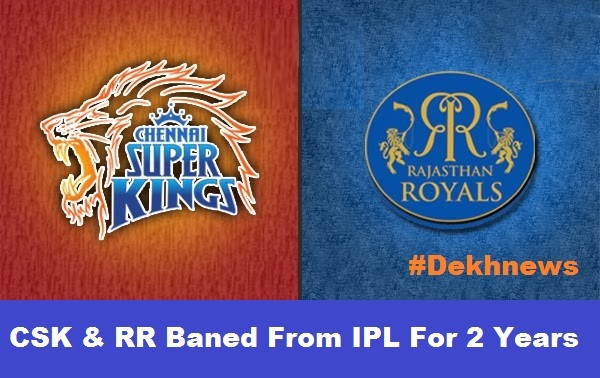 IPL CSK & RR Team Suspended For 2 Years Found Spot Fixing Verdict : Today in metting Justice Lodha committee ban Chennai Super Kings and Rajasthan Royals for 2 years from Indian Premier League. Both CSK and RR teams finds verdict. And Both Meiyappan and Kundra have been banned for life for taking part in any cricket-related activities in future. The Supreme Court appointed Justice Lodha Committee is all set to render its verdict and announce the quantum of punishment for Gurunath Meiyappan and Raj Kundra and their respective Indian Premier League (IPL) franchises vis-a-vis the spot fixing and betting scandal that rocked the Twenty20 tournament in 2013. The Rajasthan Royals (RR) are a cricket franchise representing the city of Jaipur in the Indian Premier League. The Chennai Super Kings (CSK) are a franchise cricket team based in Chennai, Tamil Nadu that plays in the Indian Premier League (IPL). Now below get complete details of IPL CSK & RR Team Suspended For 2 Years Found Spot Fixing Verdict. Chennai Super Kings (CSK) team official Meiyappan and Rajasthan Royals co-owner Kundra were found guilty of betting in the 2013 edition of the Twenty20 cricket tournament. Justice Ashok Bhan and former Justice R. Raveendran to determine appropriate punishments for Meiyappan, Kundra and their respective franchises. In March, the panel had also issued showcause notices to Meiyappan and Kundra seeking their reply on the quantum of punishment. Meiyappan is the son-in-law of former Board of Control for Cricket in India (BCCI) president and current International Cricket Council (ICC) chairman N. Srinivasan.